We went canoeing in Boston Harbor on Monday (That’s in Washington, not the one in Massachusetts). And we saw some huge jelly-fish. Gives me some pause for thought on future alien designs. Speaking of “pretty,” don’t forget that today’s (and every day’s) original art is for sale (see the big blue box just below the strip). And lastly, in the news: a few years back, the celestial man’s-best-friend “pluto” lost planet status, but now they’ve found that a-girl’s-best-friend is out there. Someday dogs will be lucky and their best friend, man, will get beyond the moon too. Cool comic, I’m going to keep reading it! Choan’s officially my favorite psychopath. Where’s Dimitri? Changing out of his slip? @Matt, he’s in the arcade, slipping out of his change. AAAAHHHHHH …..jellys they burn oh god they burn. what? she let scarf and tail get into the other mecha?! @HarlequinTiefling: Of course she did. That was the entire point of having two. It wouldn’t be any fun otherwise! I mean, what would she do, beat up an empty mech? That’s just boring. I heard about those giant space diamonds, pretty awesome. Love the comic by the way. Keep up the great work. Growp’s vendetta against Emily is one of the best sub-plots ever! Plus, the presentation of that vendetta is pure genius. I particularly like how quickly the humans have taken the surreal chaos around them as a matter of course. Warring mech-bots crash through a (presumably) steel wall and they stand there like its the most normal thing in the universe (maybe it is). Except Dustin, who continues to be shocked by each new development. Well, it’s about time Krep got to be in the action! @Harlequin, it’s like I wrote the other day: they fight, they break up, they get together; fight, break up, get together. Pretty soon they’ll be getting matching tattoos. In that case it’s only a matter of time before Dimitri sleeps with her (assuming compatibility) =P. Dusty’s quizzical expression in the last frame is a classic! Love the expressions on the characters throughout this strip! Also love Shaix’s hair standing on end, as well as Krep’s one-liner. 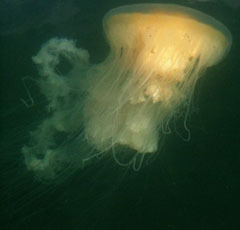 And cool jellyfish picture – it looks like it was taken underwater. Was it? Hold up, they have stun guns in this universe? Why would they every talk? Walk into a room, stun everything that moves, grab your target and leave. @ErikZ, but if they did that, when would the evil villain (as opposed to the good villains) ever get a chance to start monologuing? Besides, it’s MUCH easier to transport your target when said target is transporting his/her/its-self (i.e., walking) than when you have to haul gawd-knows-how-many-kilos-and-couldn’t-he-have-cut-back-on-the-furryite-sandwiches-with-strumplings of motionless mass back to your vessel. @Sean K., it was actually just near the surface and decided to swim sideway for a minute. So cool looking. @ErikZ, @JKCarroll has the sense of it. Both for the sake of the story and for the carrying-dead-weight issue. But also, there are general civil or humanitarian rules, where you don’t start shooting until you’ve met resistance. You know, if you ever decide to do a book of this comic I’m buying it. Best damn thing out there. Lie on the floor twitching. Now there’s a plan. Is it coincidental that Dimitri isn’t pictured with the group? Dimitri is, in fact, not in this page/scene. Not an accident. He’ll be back in the next one though. Humans as a species are very flexible. But not all of us. And those bots were just casually sitting there, waiting to be used in an epic fight of metal and steele? I’d like to say Emily should’ve destroyed the one robot with her advantage of her being ahead, but she probably let him get in the other one as an act of fairness and honor.